Spanish Chorizo with Cheese. (c) Lisa Sierra 2014 Licensed to About.com Inc. This is a simple, but delicious appetizer or tapa that everyone enjoys. It involves very little or no cooking, and you can put it together at the last minute. Although you could simply set out a basket of bread and a platter of Manchego cheese, jamón Serrano and Spanish chorizo, you would probably see it disappear almost instantly. Serving the tapa prepared on individual baguette slices makes it last longer! 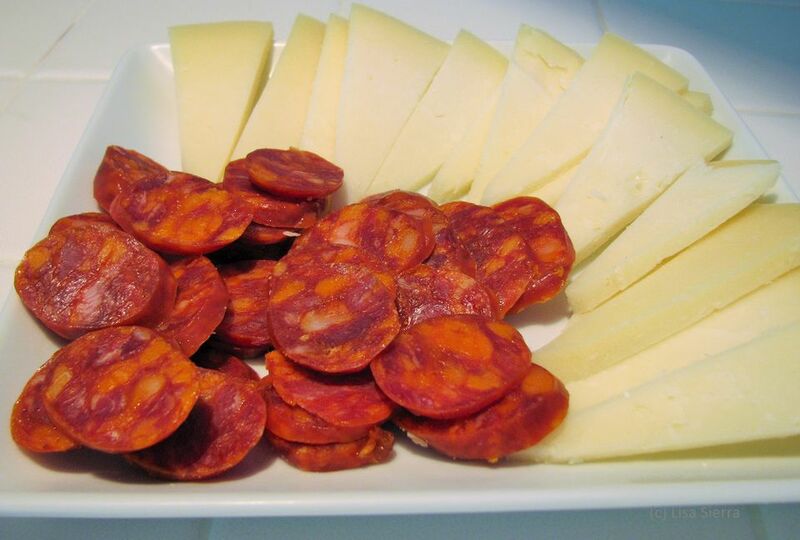 Spanish Chorizo: This sausage is very different than Mexican chorizo. Spanish chorizo is a firm, dry sausage where most Mexican chorizo is fresh and soft, not cured sausage. It also has different spices than Spanish Chorizo, so it is not a good substitute for this recipe. If you need a substitute, try using Portuguese Linguica sausage, which is very similar to Spanish Chorizo. Serrano Ham: Depending on where you live, Serrano Ham may be a bit difficult to purchase locally. If after a few calls to specialty supermarkets and/or ethnic grocery stores in your area does not turn up anything, try ordering over the internet. Slice the crusty baguette, making the slices about a 1/3-inch thick. Slice the Manchego cheese, approximately 1/8 – 1/4-inch thick. Slicing the cheese thinly may prove tricky because it is dry and crumbly. Don´t worry, you´ll only need small pieces to place one on each piece of bread. If you have a whole piece of jamón, you’ll want to slice it in paper-thin slices. If you purchased the jamón already sliced, cut the slices into pieces small enough to fit on the top of the baguette slices. Slice the Spanish chorizo into pieces about 1/4-inch thick, ready for frying, optional. Some people prefer to simply slice the chorizo and serve, while others enjoy it more lightly fried. Place a large open frying pan with a heavy bottom on the stove with a teaspoon of olive oil and move to cover the bottom with oil. Turn burner on medium heat. Place the chorizo into the pan and fry pieces for 5-10 minutes, turning as necessary. Remove as soon as the chorizo is cooked. Place the baguette slices on the platter. Place one piece of cheese and a piece of ham on each one. On others, place a piece of chorizo. Serve with a red wine such as a Rioja or a Ribera. Now sit back and watch these delicious tapas disappear!